This month we salute the mighty angiosperm. 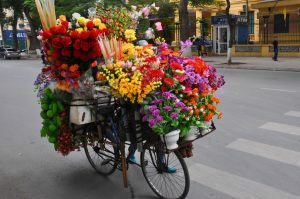 Whether you connect with flowers through horticulture, counter-culture, or pot-pourri, we encourage you to decorate yourselves or your bikes accordingly. Costume possibilities abound: super blooms, bees and hummingbirds, guns with flowers coming out, floral print Hawaiian shirts. Whatever’s your pleasure, we hope to see you on Friday! Meet at The Bike Church at 7pm, roll out at 7:15.